Stereoscopic Player is a versatile 3D movie player. It allows you to play stereo­scopic videos and DVDs (external decoder required) and also allows you to watch live video from a capture device. Since it is based on Direct­Show, it can handle almost any media format, for example AVI, MPEG, WMV and ASF. Videos can be coded in several different stereo­scopic formats. Please see the feature list for supported input and output formats. ... and a few more details Why is it necessary to use a special software for 3D movie playback? The reason is that there are a lots of different ways to watch stereoscopic content as well as different ways to store the content. In the past, it was necessary to encode a stereoscopic movie for each viewing method, for example you had to create an anaglyph file, a interlaced file for use with shutter glasses and a side-by-side for for free-viewing without glasses. Quality was often very low, because most video codecs don't handle interlaced content well and subsample color information (reducing color resolution to quarter of original resolution), which reduces anaglyph quality dramatically. The solution to above problem is creating just one file and convert it in real-time to the desired output format. Stereoscopic Player is such a real-time conversion application. Stereoscopic Player works this way: You load your stereoscopic movie, tell the player how it is encoded and finally select the desired viewing method. For your convenience, Stereoscopic Player remembers input settings for each stereoscopic movie in its integrated video library so that you don't have to re-do all the configuration steps again and again. For the most popular 3D-DVDs and 3D video files, Stereoscopic Player can even retrieve the proper settings from a web server. If you are creating content yourself, you can ship your video files together with a Stereoscopic Information File (*.svi), which also eliminates the need to specify the input format. In addition, Stereoscopic Player can be controlled by several command line parameters. What about 2D-3D conversion? Please note that Stereoscopic Player can not convert 2D content to 3D! There is no real-time conversion algorithm available which works reasonably well. Computer are not smart enough to understand what's in the foreground and what's in the background yet. Since Stereoscopic Player is a high quality product, no inferior conversion algorithms were incorporated into the player. Stereoscopic Player requires real stereoscopic movies, containing both left and right view. 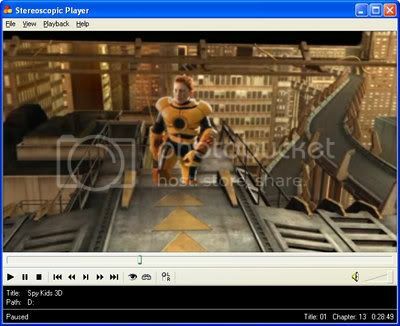 The private edition lifts the playback duration limit of the unregistered version. It must be used for non-commercial use only. 1. If you use Stereoscopic Player at your company or make money by using the player, even indirectly, you are liable to purchase the commercial edition. The commercial license is limited to an audience of 5 people. 2. A cinema license is required when doing stereoscopic presentations for an audience of more than 5 people. The price depends on the maximum size of the audience. The Private Version is availiable for immedate purchase (and the free version is ready for immmedate download) or if you are interested in either of the two other licenses please contact us.